Navi TeamIsland and Series 1 were awarded at the Australia Good Design Awards, highlighting their innovation and insight-led designs within the Product Design category. 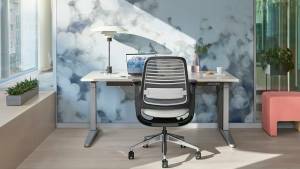 SYDNEY May 18, 2018 – Steelcase took home double honours at the 60th Annual Good Design Awards Ceremony, with the Navi TeamIsland and Series 1 designs each receiving a coveted Good Design Award® for Product Design. The awards are the oldest and most respected design accolades in Australia – and this year they attracted a record 536 design entries. For Steelcase—whose products and services are centered around physical, emotional and cognitive wellbeing in the workplace—it was an incredible honor to be celebrated and recognized for their commitment to innovation and quality in design. Informed by extensive research into workplace needs and behaviors, Navi TeamIsland is for people who choose to vary their postures throughout the work day: offering a variety of settings so people can change from one posture to another seamlessly, without interrupting workflow. 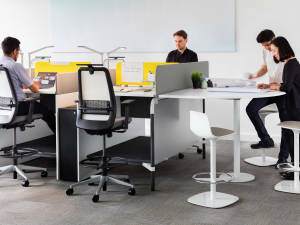 Navi TeamIsland is available in both desk height and HighSit, to support a range of sitting and standing postures. Future-focused, the desk and seating configurations can evolve fluidly, offering flexibility that doesn’t compromise on economy of space. Designed to help dynamic teams connect and collaborate, Navi TeamIsland uses space efficiently with flexible arrangements that can grow with teams, to fit up to 17% more people in the same area. This is the second time Navi TeamIsland has been recognized on the world stage, after receiving a Silver Award at the DFA Design for Asia Awards 2017 in Hong Kong. Steelcase Series 1 delivers an impactful proposition for workspace seating: a product range boasting choice and comfort, all contained in a refreshingly slim profile and footprint for its class. For creative workplaces seeking to bolster productivity while expressing their own unique brand identity, Series 1’s dynamic selection of knit, flexor and lumbar colors, and wide range of shell and finish options, allow for rich customizations. This award follows on from a big win at the 12th Annual Interior Design Best of Year Awards 2017 in US, where the Series 1 was awarded Best of Year in the Seating – Contract/Task category. The Australia Good Design award ceremony included a special guest presenter, Danish architect Jan Utzon, son of Jørn Utzon, the designer of the Sydney Opera House, where the ceremony took place. The winners of this year’s Good Design Awards will be on display to the public at the Vivid Sydney festival, alongside a vibrant showcase of music, art and design. The exhibition will be held at the Sydney Overseas Passenger Terminal, Circular Quay, on 25–27th May 2018. Good Design Australia is an international design promotion organisation responsible for managing Australia’s annual Good Design Awards and other signature design events. With a proud history that dates back to 1958, Good Design Australia remains committed to promoting the importance of design to business, industry, government and the general public and the critical role design plays in creating a better, safer and more prosperous world. For more than 105 years, Steelcase Inc. has helped create great work, education and healthcare experiences for the world’s leading organizations. Our family of brands, including Steelcase®, Coalesse®, Designtex®, PolyVision®, Turnstone® and AMQ™, offer a comprehensive portfolio of furniture and technology products and services. Steelcase is globally accessible through a network of dealers, including over 800 Steelcase dealer locations, and is a publicly traded company with fiscal 2018 revenue of $3.1 billion.